Last week I announced that I needed to take a break from my series on the violence of God, and that I was considering doing a series on Calvinism instead. I ran a survey to see if people were interested in this, and 98% of you said “Yes!” So here is the first post… (Some of these posts on Calvinism ended up in my book, The Re-Justification of God which can be found on Amazon. 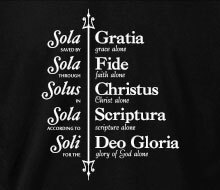 The rallying cry of the Reformation centers around five solas (or in proper Latin, the five solae): Sola Gratia, Sola Fide, Solus Christus, Sola Scriptura, and Soli Deo Gloria. Though not actually stated in quite this fashion until the 20th century, these five statements summarize what the Reformation was about. The Reformation was about authority, tradition, and justification, and the leaders of the Reformation believed and taught that everything we have from God, is Sola Gratia, Sola Fide, Solus Christus, Sola Scriptura, and Soli Deo Gloria. I affirm all five statements. I consider myself to be a child of the Reformation. Certainly, there are many things I appreciate about John Calvin, Jacobus Arminius, Martin Luther, and the other Reformers, but I have too many differences with the main theological arguments of each man to be comfortable identifying myself with the theological systems that bear their names. Ironically, my main area of disagreement with Calvinism and Arminianism is that they do not take the five solas far enough. That is, the Reformers and their followers stopped short of fully reforming their theology around the five solas. Having begun with the revolutionary truths of the five solas, they failed to follow through on the full theological ramifications of these five statements. As a result, the Reformation sputtered to a halt and—in my opinion—ultimately failed. If you were to compare the typical writings of the average Calvinist, Arminian, Lutheran, and Catholic theologians, you would discover that when it comes to the issues of faith, grace, the accomplished work of Jesus Christ, the authority of tradition over Scripture, and the goal of glorifying God in all of life, there is very little distinguishable difference (See the journal article I wrote on this several years ago). It is not just me saying this. There have been talks in recent decades between prominent leaders of these various groups to all reunite into one group. The primary sticking points, it seems, have nothing to do with the five solas, but center instead on issues like Mariology, the veneration of the Saints, and papal authority. I believe that if the Reformers and their followers had resolutely held to the five solas, the spiritual landscape of the world today would be much different. The Reformation would have continued to do its work, so that grace, faith, love, and freedom would flow out of the church today in ways that have not been seen since the church began nearly 2000 years ago. Of course, one cannot blame Luther, Calvin, Arminius, or any of the other Reformers for not fully following through on the ramifications of their own theological insights. Theological development is a multi-generational endeavor. We can, however, challenge both the contemporary and historical followers of the Reformers to advance upon the teachings of their forebears. No Reformer, I believe, ever thought that his beliefs were perfect and that nobody could ever improve upon his teachings or take his ideas further. The Reformers would agree, I think, with what some people say about the Reformation: “Always reforming; never reformed.” The reformation of church and theology is never over. Just as the Reformers sought to reform the church of their day, so also, they would want those who came after them to continue the reforms “till we all come to the unity of the faith” (Ephesians 4:13). That is the purpose of this series on Calvinism. I hope that the information contained within these posts will build upon the reformations that began during the Reformation and will lead to further reformation in the future. Specifically, I want to provide Calvinists and non-Calvinists with a perspective on certain passages of Scripture which will hopefully allow people to see that there are viable alternatives to Calvinism and it’s theological opposite, Arminianism. There is a balanced middle ground between Calvinism and Arminianism. 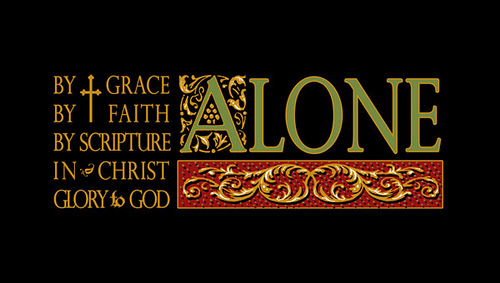 Though there are numerous avenues that one might take in seeking to provide a non-Calvinistic perspective on Scripture, the route I have chosen is to emphasize the biblical teaching on “faith alone” and contrast it with what is often taught in Calvinism. I want to show how Calvinism, though it claims to defend sola fide, actually undermines it with every point of its theological system. Related to this, the book will also contain a heavy emphasis on radical, outrageous, shocking, scandalous grace. Of course, I cannot write about faith or grace without mentioning Jesus Christ. All of this discussion will revolve around what the Scripture says, rather than on human or religious tradition, and ultimately, the entire discussion is for the glory of God as I seek to help others see the radiating grace of God in the face of Jesus Christ as He died on the cross for the sins of the whole world. Hopefully, as these posts progress, you can proclaim the five solas aloud with me: Sola Gratia! Sola Fide! Solus Christus! Sola Scriptura! Soli Deo Gloria! I can’t wait for the following posts! Personally the following are things that I can’t personally really get to off the Solas and without Tradition and specifically councils. 1. The doctrine of the Trinity. 3. A uniform, ontological Devil. 4. A uniform, ontological Hell. Personally, I see the ideas in the heads in the authors of Scripture quite varied. I also see areas where the Reformers seem to have needed to challenge ecclesial authority to refute clerical abuses–sale of indulgences and offices–without considering the logical consequences of their justifications. I think Evangelical and Protestant Christianity needs more Tradition for its positions than it is aware of. I would love it when Jeremy would talk about your 5 points Brain. P, sounds difficult to think about an talk about. But I recognize some of these problems in my struggle on theology. Oh wow! How perfectly stated. I have struggled for many years to define my thoughts and beliefs, failing miserably in the process. The closest I came is to your point of the reformers did not make that pronounced of a change. I also agree that reformation was a process not so much an end goal that was already achieved. I can’t wait for the upcoming posts. Thanks, Kevin. I’m looking forward to them too! Ha. You have summarized it well, Jeremy! Thanks. I will draw some friends’ attention to this for sure. Sola scriptura yes! Yes! YES! And by scripture I mean the apostolic authority of Peter, Paul et al. But sola fide ‘Well maybe’. I say ‘well maybe’ because so much of the teaching about sola fide comes out of a certain reformation reading of Galatians Romans and Phillipians. It does not have the same authority as Scripture. I can not use sola fide as a starting point and foundation for theology. In my reading and study, it seems that while many Reformed people talk about the authority of Scripture over tradition, in actual practice, they seem to value tradition over Scripture, just like many of these other groups do. I only affirm 3 of those Solas. Interesting that Scripture, Faith and Grace were the original three, the other two, including two of the ones that you hold were not in the original list. You are correct to do so. Sola Fide and Sola Scriptura are both unbiblical. Protestants argue for faith against works, even though James says faith without works is dead (2:14-17). And Rev 2:23 says, “I will give each of you what your works deserve.” Don’t forget Mt 25 where Jesus says that those who did not perform what, in Catholicism, are known as the Corporal WORKS of Mercy, will be condemned to “the eternal fire prepared for the devil and his angels.” As for Sola Scriptura, 1 Tim 3:15 days the Church is the pillar and foundation of the truth, not the scriptures. Yes, the scriptures are necessary to understand Salvation history from Adam to Jesus and beyond, but whose interpretation of scripture? Many people have difficulties believing in a God who allows evil and suffering, but I think I’d have just as much of a problem with a God who didn’t give me a way to understand what He wants me to know in order to love Him and my neighbors more perfectly, in this life and the next. The typical Protestant believes one should just read the Bible and be led by the Holy Spirit, but that can’t be the answer as there are 20,000+ Protestant denominations all teaching different Jesus’/gospels/doctrines (see 2 Cor 11:4, Gal 1:8, 1 Tim 6:3) even though they read the same Bible. The answer I believe lies in the teachings of the Catholic Church. I like your idea of continual reformation – this world changes so quickly and so often that we need to keep throwing new light into the old truths.